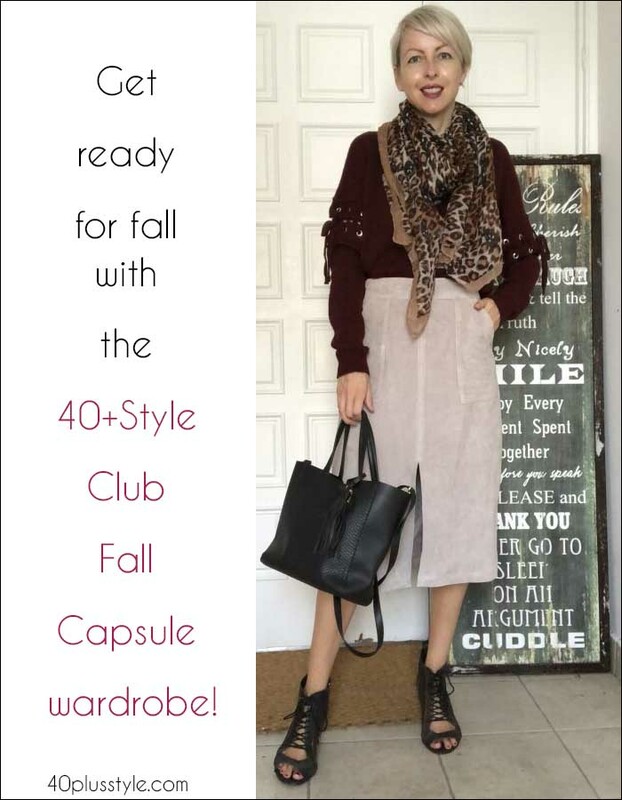 Get ready for fall with the 40+Style Club Fall 2018 Capsule wardrobe! Fall is nearly here, which means it’s time to get ready for what can be the most stylish time of year! Fall is a time when you can play with textures, patterns and beautiful autumnal colors. Not only that, you can use layering to your advantage, to add extra oomph to your outfit, to play up the parts of your body you love and downplay the parts you aren’t so keen on. You will want to look chic and put-together, while staying warm and cozy as temperatures start to dip. 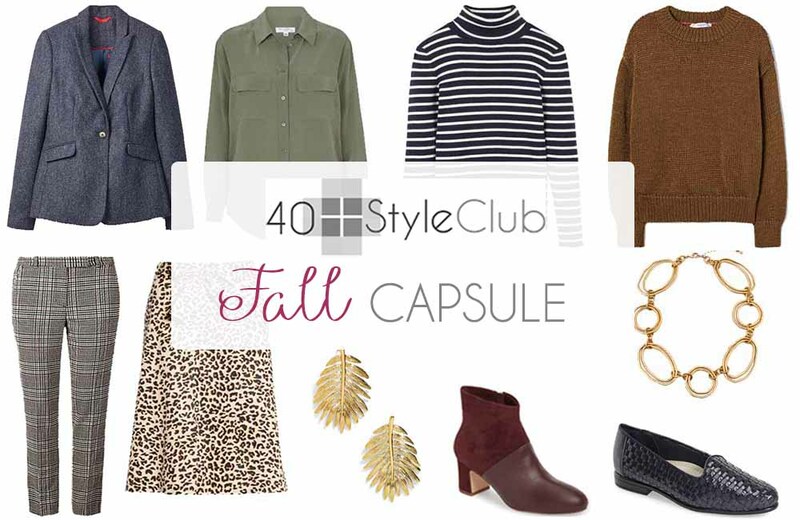 Our new fall seasonal capsule for the 40+Style Club is full of classics which will see you through not just this fall, but many more to come, whether you are running errands, meeting friends or family, or simply heading out for a walk. Below video and image will give you a glimpse of the capsule wardrobe. Style club members are already getting busy planning their own ways to interpret the fall capsule and will be sharing their finished looks with each other in our private group. As you start participating in the community, you will get to know the other members and their style and special friendships are formed. 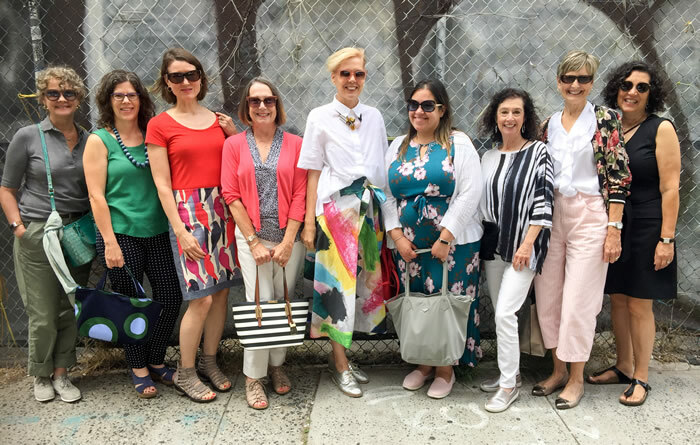 Just this week, we had a special live meetup with style club members in New York! The style club season capsule explained! Every season, we create a unique capsule for style club members, using the latest trends for the season, and interpreting them in a way which is not just super stylish, but also wearable for everyday life. This makes it easy to create your own capsule wardrobe for fall, and will give you lots of ideas for putting together your own outfits. Every season, the capsule is made up of around 12-15 pieces of clothing, along with various accessories including jewelry, scarves, and bags. This fall, there are 13 pieces of clothing, along with shoes and accessories, and we show you how to put together countless outfits, which will definitely see you through fall. This season, you can put together a whopping 100 outfits by mixing and matching 13 items! You can take the season capsule literally by buying the selected pieces online. We give you shoppable links to make it easy to find each item, along with alternatives in various price categories. Or, you can choose to shop your own wardrobe for pieces which follow the same theme. Members are encouraged to create their own version of the capsule wardrobe. 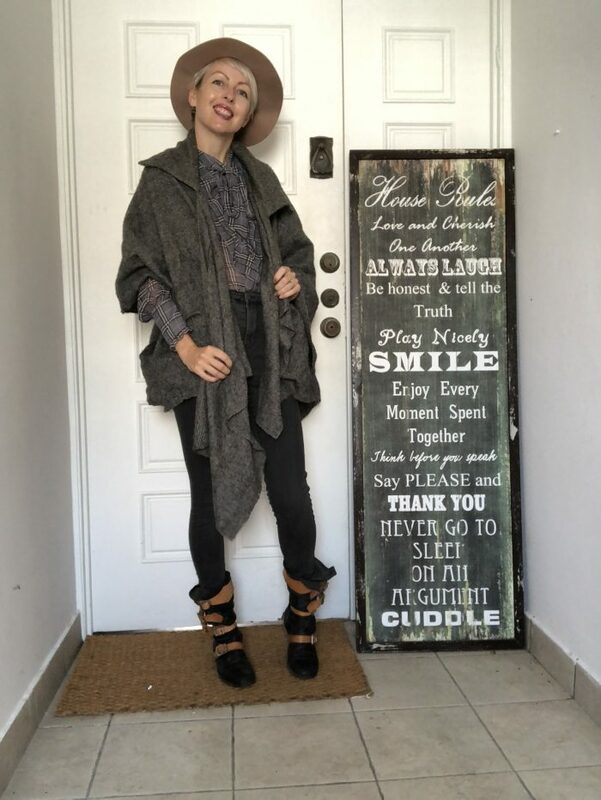 The style club is all about gaining confidence and defining your own INDIVIDUAL STYLE. That’s why each of the capsules are used as guidance, rather than a strict list of what to buy. Because the style club features in-depth training to help you discover your own style, each member interprets the capsule to suit their own personality and body type. Each seasonal capsule is not just about putting together your own capsule wardrobe, but about sharing with the other stylish women in the club! While there are dozens and dozens of outfits you can create from the capsule pieces, we do a style challenge together, focusing on 10 unique outfits. 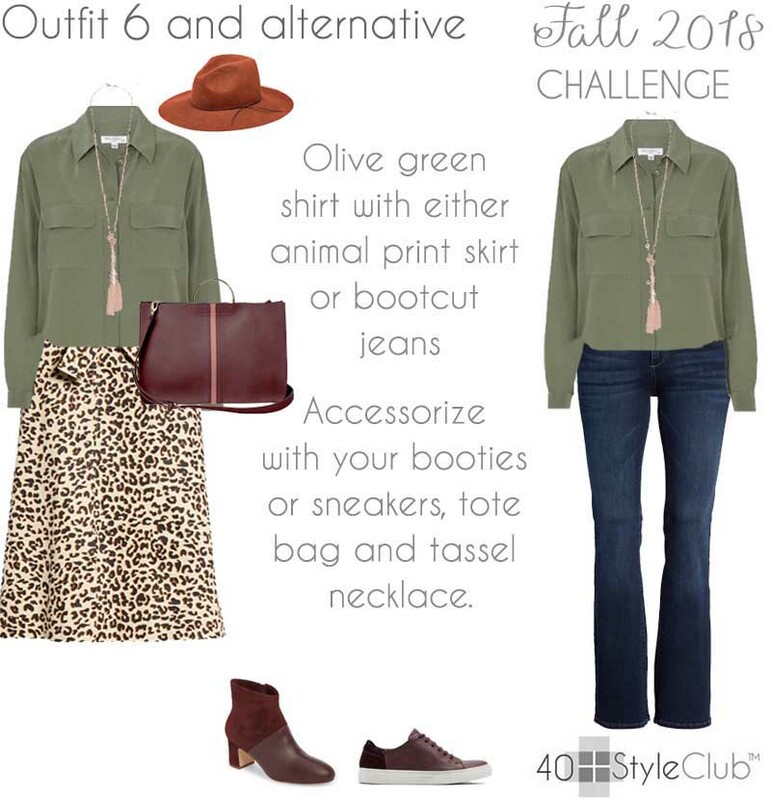 The best part of the challenge is not just defining your own style but in seeing all of the different interpretations of the same looks by members of the club. We share our outfits through the members’ only Facebook group, with members not only taking inspiration from each other, but also benefiting from the expert insights of 40+ stylist Ruth Essex. This look is one of the simplest from the capsule and is really a blank canvas to add your own interpretation. Here’s mine! I’m in Singapore, so I don’t have a lot of fall and winter wear with me. But, I’ve shopped my closet and put this look together. I’ve had everything in this outfit for years. The suede skirt is a bit lighter in color than I’d ideally like for fall and I don’t have a brown sweater. But, I do have burgundy knitwear, which is a key color in the fall capsule. I’ve also accessorized with a scarf with takes the leopard print from other elements of the capsule. I don’t have a pair of flat lace-ups or sneakers which would go, so I’ve gone with lace-up shoe boots which are from All Saints. They have a low heel so they’re still comfy. I absolutely love the plaid trend for fall and I think I definitely need to treat myself to a pair of checked pants!! But, for now, I’m still shopping my closet, so I’ve swapped the pieces over so my shirt, which I bought a few years ago from ASOS, is plaid and my pants are a block color. I don’t have a tweed blazer, but I do have a tweed wrap which is from Vivienne Westwood. I’ve accessorized with a felt fedora and boots, which are also Vivienne Westwood. These two pieces are among the most expensive in my wardrobe, but I’ve had them for a decade and I still wear them every fall and winter. I also take the wrap with me everytime I travel as it’s cozy for journeys. I can’t wait to see how our style club members will interpret the outfits in their own way! 10 reasons why the seasonal capsule is functional and fun! You get an edited overview of all the best trends of the season. We’ve trawled through the high street to find you the most current pieces for the season. The capsule helps you to focus on planning your own seasonal wardrobe. You will learn how to mix & match your pieces so you can create more outfits with less! The 10-outfit challenge gives you even more ideas for your outfits. Not only that, but you get the inspiration from other women as everyone does something completely new with the suggested outfit. You can get constructive feedback from 40+ stylist Ruth Essex in our supportive members’ Facebook group. You’ll save money as you’ll see you don’t need your wardrobe to be full to bursting to create dozens of outfits. You’ll find each seasonal capsule builds on the one before. For instance, there are pieces from the summer capsule which would work with the fall clothes and accessories. Most of all, you’ll have fun, and learn to define your own style with the support of other members! Do you want to do more with fewer pieces? Do you create capsule wardrobes? Some of your styles would not be right for me. I look best in V-necks or scooped but do like scarves. I look best in warm colors and avoid black and dark navy. I love the gold leaf-like earrings, but didn’t see a link for where to buy them- can you provide that if you have it handy? Thanks!